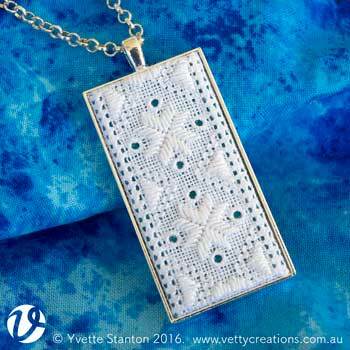 This counted thread embroidery pendant features hvitsøm, which is whitework from Norway. Hvit = white, søm = seam (or stitching). Alternatively, it is sometimes written, kvitsaum, with the same meaning. The embroidery is worked in white linen thread on white linen fabric and mounted into a pendant, ready to wear. These kits make the perfect gifts - either ready for the recipient to make, or for you to make and give as the finished pendant. Mothers, sisters, aunties, school teachers, coaches, music teachers, dance teachers, colleagues, and friends could all appreciate the specialness of such a gift. Expertise level: counted embroidery experience an advantage. full step-by-step instructions with charts and diagrams.